I like this! 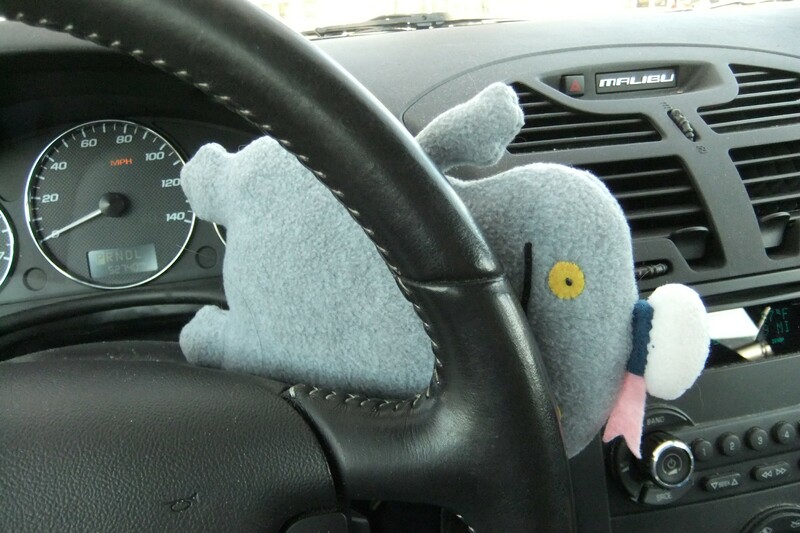 My sticker is in my car….I should go get a pick of it with Baborui. It’s a different one from other years. Other years ours were the same as yours! I can see why SB wanted to vote Green party. Some of his Ugly friends are green. Good work, Babo! Enjoy those well-earned cookies! thanks, he will. of course, mSB enjoys cookies any day, any time. Congratulations on voting, mSB. 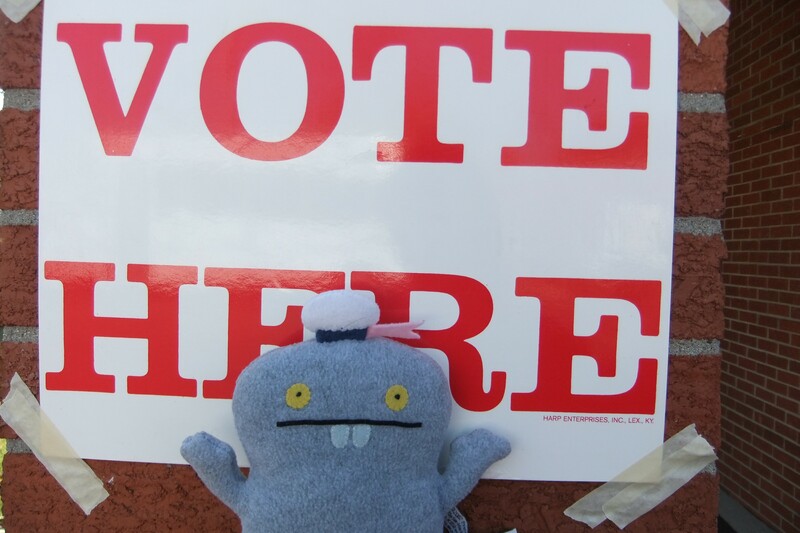 I forgot to bring my Sailor Babo to the voting place, but it’s okay because he told me who to vote for beforehand…somebody named Barack Obabo. 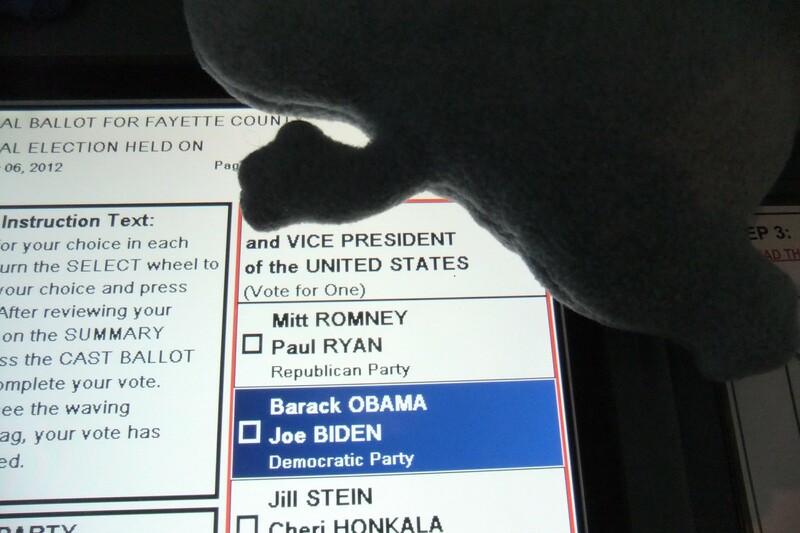 I didn’t get a sticker, just a receipt (from the bottom of my ballot)… and the satisfaction of voting for Mr. Barack O. Not sure what the folks at my polling place would have made of Sailor B, though! 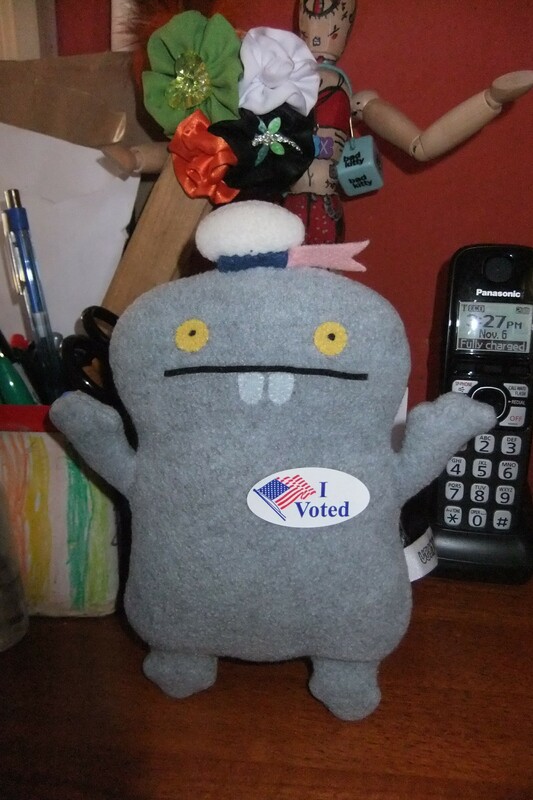 I’m sure Sailor Babo is not the weirdest thing at the polls today. some fellow went as Big Bird! More seriously, I live in a county that’s probably going to be at the top of the list re. votes for Romney. Sadly, I didn’t get a sticker, since I voted by mail. :-( It seems like they could mail me one once they get my ballot. I really like Dr. Jill Stein, too, but I think a vote for our current POTUS is still a vote for fabric-American rights. mine is a very backwards state. no early voting, no voting by mail. absentee ballot only if you have a valid excuse. the least they can do is give us stickers. Dr. Jill Stein would have been a good choice if mSB lived in California, a non-swing state. 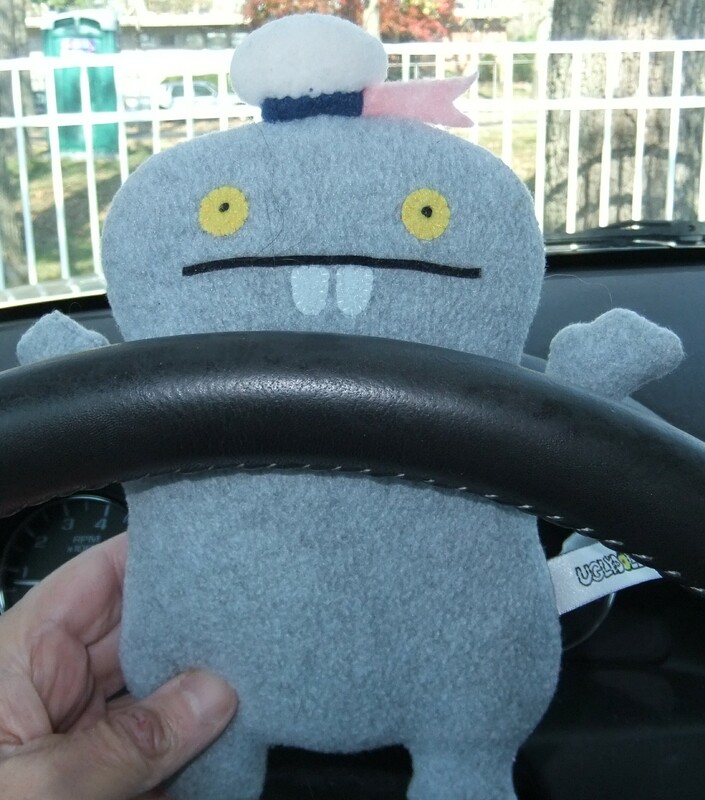 Hope mariser took Sailor Babo out for his post-election cookie! LTSB had a hard time choosing between Mr. Obabo and Dr. Stein. He’s sure they both appreciate the struggles of Fabric-Americans for equality and cookies, and welcome people of all colors and shapes. He tells me that Seasick Sailor Babo definitely voted Green. Since we vote by mail, we don’t get a sticker. He also wishes the ballot was smaller, it tires out his little legs walking something twice as tall as he is, carrying a black pen. oy, California and all the props in the ballot. no consideration for those of small stature and little legs. I’m jealous of all y’all voters-by-mail. “And there’s two pages! FOUR sides!” he pipes up. I’m Stevil and I approve this post.